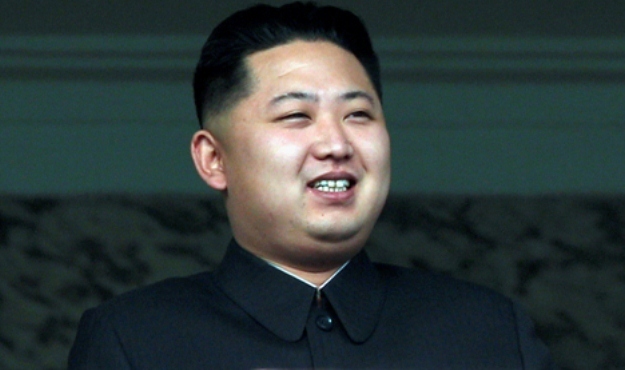 Kim Jong Un: Following in his Father’s and Grandfather’s Footsteps, or Charting New Seas? Is Kim Jung Un posturing to consolidate power in North Korea? Documents may provide important historical context. Today the National Security Archive is posting a collection of documents that seek to provide some historical context for the current crisis on the Korean Peninsula, now entering its second week. In response primarily to new UN economic sanctions placed on Pyongyang for its continued nuclear weapons program, the young and relatively inexperienced Kim Jong Un has dialed up the rhetoric of invective against the United States and South Korea. He has also taken concrete steps to demonstrate his seriousness, declaring the 1953 armistice ending the Korean War null and void, declared the Korean peninsula in a state of war, closed the Kaesong inter-Korean industrial complex, warned other governments to evacuate their embassies in Pyongyang due to the threat of war, announced it is restarting nuclear processing facilities to support production of nuclear weapons, and moved missiles to its east coast for an anticipated new test, possibly timed to coincide with the anniversary of his grandfather’s birthday. As always, the dilemma is to determine how much of North Korea’s rhetoric to take seriously, how far they are willing to go in stoking tensions, and what are their ultimate goals? These and similar questions confronted the U.S. in the early 1990s, as Washington and its allies dealt with a crisis over North Korea’s nuclear ambitions that led the U.S. to consider, however briefly, possible military action to take out Pyongyang’s nuclear facilities. The situation then, as now, was further complicated by the death of Kim Il Sung in the summer of 1994 even as the Agreed Framework to end the nuclear crisis was brokered by former president Jimmy Carter. As the documents posted today demonstrate, there are notable recurring patterns in these periodic episodes of deliberately heightened tensions: Pyongyang’s need to be taken seriously, the desire for the United States to deal directly with North Korea on an agreement to bring peace to the peninsula, a related desire to secure economic and financial assistance from the West, and the conviction that only its acceptance as a nuclear state will bring true security to a regime that at times seems unwilling to be reassured. Likewise, following the death of Kim Il Sung, his son Kim Jong Il faced a protracted period before his leadership position was consolidated, and as one of the documents posted today suggest, Kim Jong Un has likely faced his own challenges in working to consolidate his position, especially with the military. Finally, a key factor in how the current crisis plays out will be the role played by China, a question that is addressed by a DIA analysis of Bejing’s possible reactions to different contingencies on the Korea peninsula in1994, ranging from new sanctions to all-out war, included with today’s posting. 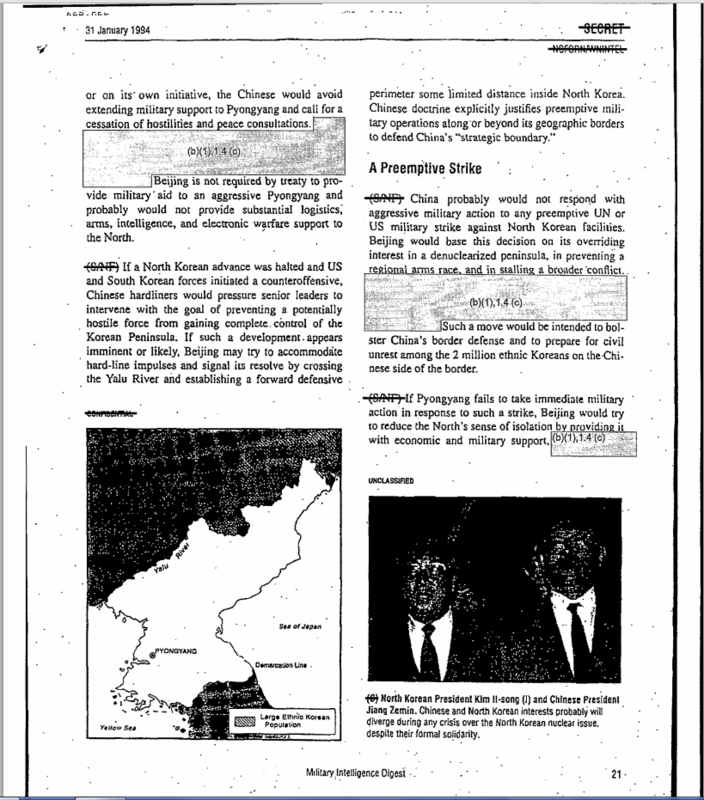 A page of a DIA analysis of Bejing’s possible reactions to different contingencies on the Korea peninsula in1994. It is hoped that these documents, which likely have their counterparts in reports being made to President Obama and Secretary of State Kerry today, provide an appreciation of the many unknowns and hard-to-predict contingencies that have perennially surrounded efforts to understand and deal rationally with the Hermit Kingdom. Also, they provide something of a benchmark for what in the past was seen as “normal” for North Korea, and thus a marker against which Kim Jung Un’s rhetoric and actions may be compared.